Our spring 2015, coast-to-coast extravaganza to celebrated the publication of A PASSION FOR PARIS: Romanticism and Romance in the City of Light, starts on April 21 when we fly from Paris to Boston. See below for our schedule of dates, venues and times. 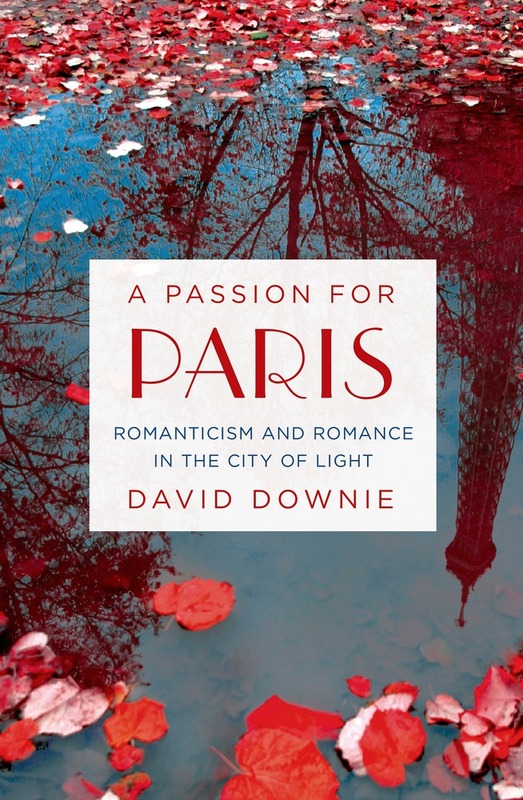 A unique combination of memoir, history, and travelogue, this is author David Downie’s irreverent quest to uncover why Paris is the world’s most romantic city—and has been for over 150 years. Abounding in secluded, atmospheric parks, artists’ studios, cafes, restaurants and streets little changed since the 1800s, Paris exudes romance. The art and architecture, the cityscape, riverbanks, and the unparalleled quality of daily life are part of the equation. But the city’s allure derives equally from hidden sources: querulous inhabitants, a bizarre culture of heroic negativity, and a rich historical past supplying enigmas, pleasures and challenges. Rarely do visitors suspect the glamor and chic and the carefree atmosphere of the City of Light grew from and still feed off the dark fountainheads of riot, rebellion, mayhem and melancholy—and the subversive literature, art and music of the Romantic Age. Weaving together his own with the lives and loves of Victor Hugo, Georges Sand, Charles Baudelaire, Balzac, Nadar and other great Romantics Downie delights in the city’s secular romantic pilgrimage sites asking , Why Paris, not Venice or Rome—the tap root of "romance"—or Berlin, Vienna and London—where the earliest Romantics built castles-in-the-air and sang odes to nightingales? Read A Passion for Paris: Romanticism and Romance in the City of Light and find out. When ordering please prefer your local Indie bookstore or use IndieBound.com, thanks! Sat, April 25, 7 pm, Northshire Books in Manchester Center, VT.
Special Event with Left Coast Writers group @ Book Passage organized by Linda Watanabe McFerrin. Please let me know you are coming so I can add you to the invitation list for this event—all my friends are welcome! Join Downie (Paris to the Pyrenees: A Skeptic Pilgrim Walks the Way of St. James, 2013, etc.) for a top-notch walking tour of Paris. In search of what makes Paris romantic, the author takes us to the 19th century. Early on, he notes that Paris may be romantic just because writers, artists and musicians say it is. But romanticism is not just literary or artistic; it’s also political. Throughout the 1800s, there was a host of activists who mocked the status quo. Victor Hugo based his play Hernani, about adulterous lovers and their unfortunate end, on true life, and as Paris audiences often did, they rioted, opening the war between romanticism and classicists. Throughout the book, the author shares his love of places that he has explored for 30 years. He recounts the lives and loves of Hugo, Dumas, Sand, Delacroix and so many others in the romantic shrines of the Marais, Luxembourg Gardens and the Arsenal Library. Literature of this age reflected the essence of romanticism, where chronology and logical plots were reactionary. The French are complex, ambiguous and contradictory by nature, and they are proud of their weaknesses and faults. Understanding the romantics requires understanding Paris, and searching for the real Paris is part of the journey. On that journey, Downie is the consummate guide. Reflecting on Foucault’s pendulum, the author writes, “the real Paris is of the mind, so it doesn’t exist and can’t age.” The author’s encyclopedic knowledge of the city and its artists grants him a mystical gift of access: doors left ajar and carriage gates left open foster his search for the city’s magical story. Anyone who loves Paris will adore this joyful book. Readers visiting the city are advised to take it with them to discover countless new experiences.